Lake-Link Members Save 10% on Any Trip! Pike Pole Fishing Guide Service is commercially insured and properly licensed, meeting both state and federal requirements. Guests can fish comfortably from one of our professionally rigged boats during the open water season or from our heated Eskimo shelters during the ice fishing season. Guide trips are offered seven days a week, all year long. Open water trips are available March through November. Ice fishing trips are available December through March, or as safe ice conditions allow. 10% discount is offered to Lake-Link members and all active or retired Military, Firefighter, EMT, and Law Enforcement personnel. 50% discount is offered to all wounded military combat veterans. Guests needing lodging can also find discounts at select hotels located throughout our area. Large group accommodations at area rental homes may also be available. Advanced notice is required for these services, so please ask us about lodging discounts when calling to book a trip. Follow us on Facebook @ Pike Pole Fishing Guide Service. Those who "Like" our page have chances at winning free fishing products. Random drawings are held throughout the year. We also post and share related information pertaining to waters we fish. Pike Pole Fishing Guide Service was established with a firefighter theme in mind. Although pike are one of the fish species we target, the company name "Pike Pole" actually came from a tool used in the fire service and by whalers during the early fishing industry. 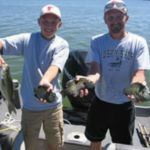 Owner, Adam Walton, started fishing at a young age with his grandfather, Roger, who is a retired career firefighter and avid angler. Roger was a huge influence on Adam's own firefighting career and professional angling passion. For open water fishing, we run three main boats, including a 2012 Crestliner Raptor equipped with a 200 horsepower Mercury motor, a 2011 Crestliner Fish Hawk equipped with a 75 horsepower Mercury motor, and a 2013 Nitro Z9 equipped with a 250 horsepower Mercury motor. All boats are equipped with side scan/down imaging sonar, Minn-Kota bow mount trolling motors, and GPS navigation. Fishing equipment and tackle, which is all provided, includes numerous high quality products. For ice fishing, Pike Pole Fishing uses the best equipment available. Many times this includes prototype and newly released products not available in stores yet! Some main equipment includes: portable Eskimo ice shelters, "Mr. Buddy" heaters, Eskimo propane augers, Marcum electronic flashers, Aqua-Vu underwater cameras and Beaver Dam products. Adam Walton is a licensed United States Coast Guard charter captain and spends hundreds of hours on the water each year. He's also a certified firefighter paramedic and CPR/First Aid Instructor. 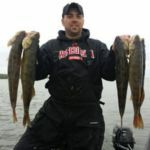 Adam specializes in year round multi-species fishing, but walleye and pan fish are his favorite. 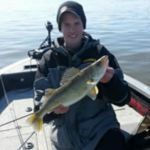 In addition to guiding and tournament fishing, he enjoys writing for a variety of outdoor media agencies and conducting fishing seminars. Adam truly enjoys the outdoors and will help get you on fish. 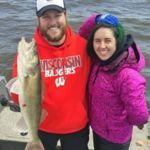 Adam is currently a pro/field staff member with Crestliner Boats, Mercury Marine Motors, Humminbird, Minn-Kota, Northland Tackle, Hard & Soft Fishing, and Vibrations Tackle. He is also a member of the Pure Fishing Select Angler Program and St Croix Rods Guide Program. Ryan Valley & Mike Zimborski are additional licensed guides for Pike Pole Fishing. Both spend countless hours on the water each season and have excellent fishing skills. Ryan specializes in bass and pan fishing. He is CPR/First Aid certified and boat operator certified. 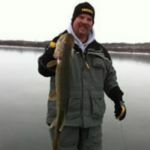 Mike specializes in both walleye and pan fishing. He is also a certified firefighter paramedic. 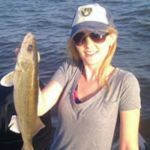 Pike Pole Fishing wants you to have a fun and educational day on the water. We offer many packages for various fish species. We can also customize packages to fit your needs. Packages shown on our "Fishing Rate" page are for one or two people, but we can accommodate larger groups. Please read the information below to help prepare you for day of fishing. Click here for fishing rates.